Pandas might be fairly rare in the wild, eat something so lacking in nourishment that they can hardly move and are notoriously reluctant to breed in zoos, but they fill the 100 Pandas pokie from IGT, with several images of the cute creatures making up the highest value symbols. There might not actually be 100 of them, but there are 100 paylines running across the game, so the title isn’t misleading us at all. Along with pandas, there’s the classic playing card symbols and a bonus icon that awards free spins in this nicely-designed pokie that comes from one of the world’s best-know game developers. 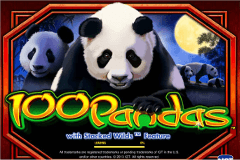 Available to play on PC’s and mobile devices, 100 Pandas has the smooth animations, quality sound effects and reliability that people expect from IGT, and because it’s a relatively straightforward game with a good range of accepted bet sizes, it can be enjoyed by casual players as well as highly experienced gamblers alike. There’s nothing particularly unusual about the design and setup of this game, with a background image being a somewhat predictable picture of the bamboo forests that pandas like to call home. It may be a bit obvious, but it still looks nice. Underneath the reels is the control panel where players are given the option to activate some or all of the paylines and to adjust their bet sizes from just 1.00 to 500.00 per spin. Multiples of the amount staked per line are won each time 3, 4 or 5 of the same symbol type land across the game, on adjacent reels starting from the left side. Pandas are of course, a symbol of China, and there’s a distinct Chinese theme running throughout this pokie. The playing card symbols, 9, 10, J, Q, K and A are all designed to look a little bit oriental, and although they pay out the smaller prizes, these will also tend to be the more frequent symbols that make up winning lines. Landing the 9 for example, will be worth 5x, 25x or 100x the line bet when 3, 4 or 5 appear, while the A is valued at 10x, 100x or 200x for the same combinations. The picture symbols feature a little more than just pandas, with some bamboo and a lotus flower also making appearances, but it’s the cute bears that players will want to see, not only because they look nice, but also because the biggest wins come from lining them up along a line. The two portraits of pandas are each worth 50x, 200x or 600x when landing 3, 4 or 5 on a line, but there’s a picture of a panda family out for an evening stroll that pays the most, while also acting as the first bonus symbol that players are likely to see. This image is worth 100x, 225x or 1000x the line bet, but as well as having such big payouts attached to it, this is also the wild symbol, acting as all except the yin yang icon to help complete lines. Players who land a matching symbol on reels 1 and 3 for example, wouldn’t get a win, but if the wild is on reel 2, across the same payline, it would act as a third example of the symbol and pay accordingly. A free spins round is started by the yin yang symbol appearing in any 3 positions on reels 2, 3 or 4. This black, white and gold image will also pay out 2x the total bet per spin before the 10 free games commence. Free spins play out at the same value as the triggering bet and should 3 or more yin yangs land during them, a further 10 spins will be added to the end of the round, with no upper limit to how many times this can happen. Although the design of the reels changes during these free games, the payouts remain identical which means wins won’t come any more quickly and they won’t be worth any more than during the main game. 100 Pandas has been developed by one of the oldest names in the business, with IGT having decades of experience in both land based and online gaming. So, players would expect to find that their pokies are well designed and come with crowd-pleasing features, which is exactly what they will get with this game. It has a nice set of symbols, although maybe even more pandas would have been welcome, along with enhanced reels in the free spins. Buy there’s a decent bet range that should suit the vast majority of players, and plenty of opportunities for winning spins thanks to those 100 lines running across the reels.